SCVHistory.com | Placerita Gold | Who Was the First Real Discoverer of Gold in This State? (Prudhomme 1922). Who Was the First Real Discoverer of Gold in This State? 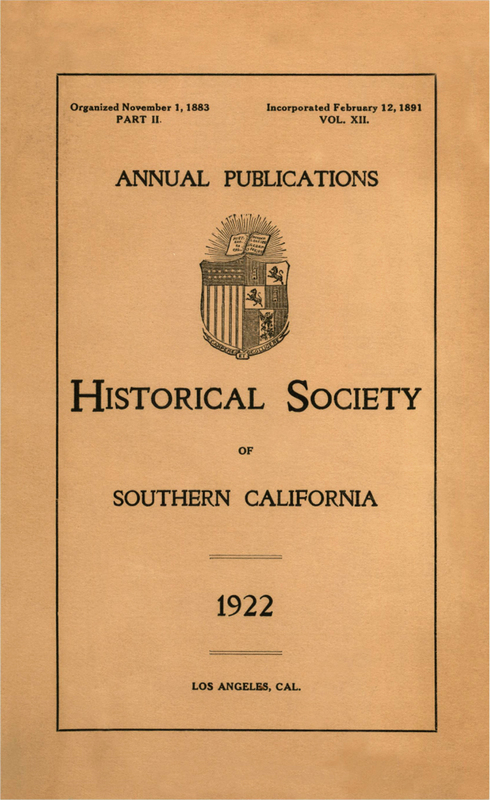 Annual Publication, Historical Society of Southern California | Los Angeles 1922. Along with the usual references to Robinson's and Stearns' letters (which reportedly are missing from the archives of the Society of Pioneers in San Francisco), Prudhomme in 1922 gives us a detailed accounting of the Francisco Lopez story as told by the same descendant — Francisca Lopez de Belderrain (Bilderrain) — who was the basis for Perkins' version 10 years later. More importantly, Prudhomme tells of an early journal entry by Cyrus Lyon wherein the latter mentions Lopez's 1842 discovery of the "Placerito Placer." Lyon's (1850s?) journal entry — which unfortunately isn't adequately sourced — might be the earliest recording of the name Placerit[a] in association with the gold discovery, and by inference a more precise location for it than the Rancho San Francisco/Francisquito, which appears elsewhere. About Prudhomme (from Huntington Library): Charles J. Prudhomme, 1854-1934, was born in Los Angeles, the son of Leon Victor Prudon (Prudhomme), a transplanted Frenchman, and Mercedes Tapia, a native Californian. Prudhomme's father played a role in early California history, participating in the Bear Flag Revolt of 1846. Prudhomme was the historian for Ramona Parlor 109, Native Sons of the Golden West, and collected historic relics related to California history. Almost every person at all conversant with the affairs of the world is cognizant of the fact that what is known as the "Gold Rush" to California, which began in 1849, was the most sudden and spectacular and notable instance of excited human migration recorded in the annals of the race. And most of the books and papers recording these adventures point out that the then City, of San Francisco was the chief center of congestion and trade, while most of the early fortunes were made by placer mines about Sutter's Creek, and Feather River, and mostly in the northern section of this state. And perhaps every one has read with interest the romance, and glamour which Mark Twain, Bret Harte, and others have cast about this wild rush and saturnalia of fortune seekers, a band often called after the Grecian fable, "The Argonauts." So that, in due time, this flaming episode in the history of the world was celebrated, and made famous to men in every part of the globe. And along with other statements concerning this notable rush of population, readers have been told again and again how this rush began, and who it was that, as it were, first touched the electric button that thus thrilled, and moved, and stirred up the world. So, in nearly all these writings we find it set down, as cold fact, that the first discovery of the attracting metal was made, and noised abroad, when James W. Marshall found gold nuggets as he worked at Sutter's saw mill, and was digging a needed trench to deepen the mill-race for a swifter flow of water to the mill. This interesting item, so intimately connected with one of the most important events going to swell the population and wealth of this state, was for a long time iterated and reiterated by writers, in the north part of the State, who constantly made it prominent, that in the month of January, 1848, the date when said Marshall found gold in Sutter's mill race, on the American River, was, in fact, the date of the first discovery of gold in California, and hence on the Pacific Coast. Nearly every writer doubtless believed it to be the truth, because he heard it from others: for a long time this statement went abroad in books and periodicals unchallenged and as the truth of history, because this gold region was near to San Francisco, and that city was then the principal seat of letters and intelligence on the coast. So again and again we hear that to James W. Marshall belongs the credit of first having discovered that there were gold deposits in California. They say that often a falsehood well stuck to, or asserted with confidence and boldness, is as good as the truth, and in this case the aphorism seems well supported; nevertheless, while that has been believed and asserted by so many, it is a grievous error; an error that does great injustice to another, and assigns the honor and credit due one man to another, who cannot justly claim it, and so fixes his laurels on the brow of another, thus falsifying the truth of history, and fixing in the niche of fame the person of Mr. Marshall, where belongs the person of another. This we will proceed to set forth in detail, and give ample proof to show that Marshall was not the first real discoverer of gold in California, nor was Sutter's Mill the place where the first discovery was made ; but on the contrary, we earnestly allege that this discovery was first made by Don Francisco Lopez, and in southern California several years prior to the discovery by Mr. Marshall, that this was in 1842, and at the locality known as Placerito Canyon, and his second discovery was made the same year at a place known as San Feliciana, and not very far from the City of Los Angeles. Also we are prepared to show that another person, Don Mariano Lopez, made a second discovery of gold at the College Farm, near Santa Ynez Mission in Santa Barbara County, in 1843; and the proof of both these facts we have collected, and under circumstances which admit no shadow of doubt in the matter. Accordingly, in detail we call the attention of the public to what follows. San Fernando Mission was founded in 1797. It was a basic center of operations, and the padres had several industrial assistants there. They had then a Majordomo-General, or general manager, and they had other men under him, as overseers. Among these was Don Juan Francisco Lopez. He also well served the padres in the Church, and at the altar, as he was well posted in all the church ceremonies. His son, who first discovered gold in California, was Francisco Lopez, better known as Cuso Lopez. He was Majordomo-General of the Church property at San Gabriel Mission. Don Francisco Lopez as the true first and pioneer discoverer of gold in California in the year 1842 was [sic] not, up to this time, been publicly accorded the credit that is due him. I presume this might arise from other causes, or it might possibly be accounted for, in part, on the ground of his nationality, for at the early date of the acquisition of California, so soon after the Mexican War there were naturally some prejudices against the Californian population, and no particular desire on the part of writers to give them prominence in an "accident of an accident" like this, which may have availed to keep Don Francisco Lopez in the background, and to confer on another the credit due him. In this rushing world it thus often happens that a man or his reputation is the victim of circumstances. I find by referring to my old account books that November 22nd, 1842, I sent by Alfred Robinson, Esq., twenty ounces California weight of placer gold to be forwarded by him to the United States mint at Philadelphia for assay. The Placer mines from which this gold was taken were first discovered by Francisco Lopez, a native of California, in the month of March, 1842. Memorandum of gold bullion deposited on the 8th day of July, 1843, at the Mint of the United States at Philadelphia. Before melting, 18 34/100 oz. ; after melting, 18 1/100 oz. ; fineness 926/100; value $244.75; deduct expenses sending to Philadelphia and agency there, $4.02; $240.73. It is a fact well authenticated by the testimony of numerous old residents that Abel Stearns continued for many years to receive gold dust and nuggets for transmittal to the mint. Mining in these regions has never entirely ceased, and even at the present several small placers are being worked. I was so informed that in 1842, forty-five miles northwest from the Pueblo, were discovered the Placerito Placer by Francisco Lopez. And the same year he discovered the San Feliciana placer mine. In 1843, Francisco Garcia was piloted to, and shown by Francisco Lopez, the location of his two discoveries. Señor Garcia then returned to Sonora, Mexico. In the course of six months he came back with thirty Mexicans, gambucinos, placer miners, and these miners were divided, some going to Placerito, the others to San Feliciana. In the later place they took out two hundred and twelve pounds of gold, advoirdupois weight, weighed by Don David W. Alexander, who in the year 1855 made an affidavit to that effect. José Salazar, one of the men who came from Sonora, Mexico, with Señor Garcia, returned to San Feliciana late in 1843, and from the place he was working took out forty-two thousand dollars worth of nuggets. The amount taken out at Placerito was never known. There is no doubt that gold, silver, quick-silver, copper, lead, sulphur and coal mines are to be found all over California. And it is doubtful whether under their present owners they will ever be worked. March 15, 1848, the printed notice of the discovery of gold appeared in the "Californian," an early newspaper of California. On May 29 the same paper announced that its publication would be suspended, — the proprietor also got the gold fever, the whole population having taken itself to the mines. In 1849 the placers of Trinity and Mariposa were opened. In 1850 the deposits of Klamath and Scott's Valley were discovered. In the spring of 1850 gold was reported as lying in heaps on the banks of Gold Lake, near Downieville. This caused a tremendous excitement, and a rush of miners to that locality. In a few weeks thousands returned from the Lake poorer than when they started. On September 9, 1850, California was admitted into the Union as a state. The number of persons then engaged in mining was estimated at fifty thousand. During the years 1857 and 1858 there were no less than six thousand persons mining for gold in the Placerito and San Feliciana. We wish here to leave on record, as part of the proof we have collected, the following. In the month of November, 1918, the writer went out to San Fernando, and there interviewed Señora (China) Maria de Los Angeles Feliz de Geremia. She was born February 25, 1825 at Los Angeles. She died in 1919, shortly after this narrative was given out. She related that she was then living at San Fernando Mission. How they celebrated the discovery of gold, which took place in 1842 at Placerito Canyon, Los Angeles County, California. A relative of the Lopez family, and a kin to the pioneer discoverer, Don Francisco Lopez, by name Mrs. Francisca Lopez de Bilderrain [alternately Belderrain – Ed. ], was interviewed by us, and she related that the Chasubles, that are now on exhibition at the Museum of History, Science and Art, at Exposition Park, Los Angeles, really were worn at the consecration of the San Fernando Mission, founded in 1797. And the same vestments were also worn by the Padres, at the great solemn high mass which was celebrated on the first anniversary of the first real gold discovery in California. This occurred in the spring of 1843, at Placerito Canyon, and not at San Francisquito Canyon, as has been reported. At this mass and celebration, she says, there were one priest from Los Angeles and two from San Fernando Mission. She described a temporary chapel which was erected on the very spot where the gold was found by her kinsman. At these services, there were twelve altar boys assisting the priests, and the whole choir from the Mission was also there, and furnished the music. All the prominent families of the Pueblo, and all that could spare the time were invited, including the Mexican Government officials, who came out specially to investigate the extent of the placer mine, in that locality. In the autumn of 1914, the late Señora Catalina Lopez, niece of the first gold discoverer, Don Francisco Lopez, had a family reunion in honor of the discoverer, and she invited all her children, grand- and great-grand-children, nieces, and other relatives to a reunion picnic on the spot where the first gold was discovered in 1842. This Señora Catalina Lopez testified that she remembered the first celebration on the same spot, very distinctly, as she was then twelve years of age, and she lived most of her life in San Fernando. Later on, when some of these old-time padres, who celebrated mass in this temporary chapel were going away, in acknowledgement of her good work among them, they presented her with this Chasuble. At her death on April 22, 1918, the mother Señora Catalina Lopez bequeathed these Chasubles to her daughter, Mrs. Saragosa Lopez Briton. The fact is that these two separate finds had been made in the southern part of the State in 1842 and 1843, but as the deposits in the south were not so rich, it was natural that the find at Sutter's, being so notably rich, should attract the most attention, — as it did. An auto trip to the old placer diggings, where gold was first discovered in this Golden State. Mr. Arthur Ellis, — who is greatly interested in past events, — and the writer, who from his youth up, had long desired to inspect for himself the locality he had often heard so many old citizens mention, where gold was first discovered in this state, lately had the good fortune to secure for a guide in their research, Mrs. Francisca Lopez de Bilderrain, a lady closely related to Don Francisco Lopez, the well known original pioneer discoverer. On the 21st of November, 1920, we rolled out from the City in a high-powered machine in the direction of La Nopalera, now known as Hollywood. We sped into the enchanting area of the San Fernando Valley. Intent on securing all possible information concerning this important historic event, we added to our passenger list at San Fernando another relative of Don Francisco Lopez, in the gracious personality of Mrs. Romona Lopez Shung, a resident of that place, who also has much knowledge of bygone events, and who consented to act as our guide. We speed on to Newhall, where we encounter the tunnel through the great mountain chain, pass Newhall, and encounter rougher ground, now having need of our lady guides to direct our course. They point out, at places, remnants of the old trail, and the road as traveled long since, — and it is surely in sore contrast with the fine highways now so common in every direction. On the hillsides we see nothing but brush, but in the canyons some oaks and sycamore trees, and at intervals a well kept rancho. Now we have left the smiling valley far behind, and after many zizzing turns, we come to the Placeritos Canyon, within the walls of which, long ago, occurred this epoch-marking event. The circumstances of the discovery, as related by our guides, are these: Don Francisco Lopez, who was greatly trusted by the padres, had at this time charge of their cattle and stock in this section. And one day in the year 1842, when in company with another herdsman he sought some stray animals, they happened to ride into this Canyon, known as Placerito. These men, being weary, tethered their tired horses, and proceeded to make themselves comfortable, taking their siesta under the shade of the oak tree. After resting awhile, Don Francisco spied some bunches of wild onions growing nearby, and calling to mind that his aunt, at parting with him recently, had requested him to bring her home the first of these he could find, he began to pluck up some of these wild onions by the roots, and while thus engaged, to his astonishment he noticed attached to the roots of the onions, certain curious shining pebbles. So he then pulled out his hunting knife, and proceeded to dig more and more and still found attached to the bunches more and more of the same kind of shining stones. His curiosity being aroused, he filled his handkerchief with these shining stones, and having bunched up a lot of the onions for his aunt, mounted his horse and returned to his home. There he found his father, Don Juan Francisco Lopez, and requested him to take them to the Pueblo, and find out what they might be. Upon due research, they were found to be nuggets of gold. The news soon flew abroad, and many men flocked to this Canyon, and worked these placers in a primitive way. To proceed with our narrative; — as we approached our destination these lady guides related many circumstances of interest and especially the preparation made by their ancestors, already mentioned, and that Santos Martinez came over with a wagon loaded with provisions, and prepared the great barbecue the day before the great crowd assembled to attend the mass, and to eat at the festal board. They also related that in 1840 Don Andres Castillero, Mexican mineralogist, reported a find of certain mineralogical specimens called "Tepetate," which he said was a good indication of placer gold. When we came into the Canyon proper, and in the vicinity of the old placer deposits, we encountered a nice lady, Mrs. F.E. Walker, and her children, who, with her husband, Mr. Frank E. Walker, — she so informed us, — had lived in that vicinity for a number of years. Her husband was away at that time but she kindly volunteered to show us what she could. So we all followed our guide. We came to the west side of the Canyon. We had not proceeded far before Mrs. de Bilderrain, pointing to a certain spot, said: "This is the place of the discovery; this is the exact location." We found there a place where the slope had been levelled down, and a place made for the temporary altar, on which they had celebrated the mass. Between the altar and the arroyo was the location of the arbor they built, and where the ceremonies and fiesta took place. After inspecting this location, and taking certain photographs, we went on following our new guide, Mrs. Walker, who was in the lead, going by the trail beside the slope of the hill. Then she suddenly stopped, and called our attention to certain specimens lying there on the ground; on examination, we found this to be "Tepetate." We then climbed up to a place where there were heaps of stones of all sizes that covered about an acre of ground, and this we learned was the debris left from the old placer diggings. This is where one man took out $80,000.00 in gold. At the south edge of this area, our guide pointed out two old monuments, something like the monuments put up by the miners, but so different in some respects as to indicate clearly that they must have been put there under the Mexican régime rather than at a later period. After showing us this, Mrs. Walker bade us good-bye and started, following the arroyo. As she was an adept at mountain climbing, she was soon out of sight. She was going to hunt up her husband. The rest of our party still lingered investigating this vestige of the former activities of miners. It was perhaps a half-hour later when we perceived an automobile coming on the public highway opposite to us, and listening we heard a sweet feminine voice sending forth a melodious "Hoo-Hoo," "Hoo-Hoo," that echoed in charming cadence from the canyon walls. And whose voice should it be but that of our late guide, Mrs. Walker, hailing us, and telling us her husband had returned, and would meet us at the house. So we soon responded to her invitation, and found ourselves back where we left our auto, thence to the house. And there we had the pleasure of meeting Mr. Frank Walker, with whom we enjoyed some edifying conversation, for he gave us much important information. Having in a measure gratified our desire to get first-hand data, and also original views of the identical spot where in the days of the missions Don Francisco Lopez made the first discovery of gold on the Pacific Coast, and having viewed this spot in company with his near relatives, who verify all our assertions in regard thereto, our mission being fulfilled to our satisfaction and joy, we turned our hustling auto about, and headed for the City of the Angels. Last, we add, let the truth of history prevail, and let justice be done, though the heavens fall. Let Mr. Marshall yield up the laurel of fame as the first pioneer discoverer of gold in California to the brow of Don Francisco Lopez, to whom it justly belongs.